.......for me! Try as I might it does look as though I will be staying with my monochrome colour palette this season. The upside of this is that I think the more minimalist wardrobe I'm trying to achieve is more doable by keeping things simple colour-wise. However....the downside of this is that I may bore you all to death with my black and white outfits with the odd splash of grey or khaki, or maybe a bit of navy!! This Mango jacket has been on my radar for a while (Fashion Mum of 40 has featured it on her blog a couple of times) as I knew it would pull a few outfits together with pieces I've already got. So I took the plunge last week and ordered it. It was love at first try....I've been itching to wear it ever since! It's the perfect smart but not too smart jacket. For the school run I can wear it with jeans, a tee and Converse, but I could easily dress it up for a lunch date with boots and my beloved Topshop Victoriana blouse or thrown it on for a night out over a jumpsuit, heels and a slick of red lipstick! It's going to be so very versatile! This purchase fared so much better than my *trends* try on! First up is the maxi dress that I had such high hopes for and which I love in my picture, however in reality the sleeves are split from shoulder to sleeve :0( and the waist is in the wrong place for me, making it almost empire line which is most uncomfortable! I do love the look though so I am currently researching others! I also tracked down and tried on the M&S blouse which is gorgeous....just not for me! This is a size 12 (all they had left in store) so it must be fairly true to size, I'd have bought a 10 and not my usual 8 in M&S. The fabric is quite creasy, it's a self embossed pattern but I think having a frilly neck and cuffs was just too fussy for me personally. Anyway, not to be deterred on the blouse front after reading this blog post by the lovely The Naughty Forty Diaries and a tip off from my fabulous friend Vik (as seen on her Instagram feed here) I was alerted to this Primark version of the Victoriana blouse which is a complete steal at a tenner! This got the old cogs turning as I bought a similar shirt in Primark last year to wear under sweaters and so I turfed it out of storage, took myself off to my nearest haberdashery department for supplies and voila! Trend covered for 95 pence, the cost of a bit of velvet ribbon. This called for a try on.....I thought the shirt looked quite cute styled like this! I'm also going to try this with tights and boots once the bare leg weather is over! Dorothy Perkins Pinafore, here in black which I feel I may also need in my life! A quick word on the M&S Limited Edition suedette waistcoat....it was nowhere to be seen! On reflection as with the M&S blouse, I am sure there will be more reasonable nods to that trend around. The M&S one was a whopping £49.50.....not quite the £39.00 that is was advertised in the brochure that I found it in!! If you should have seen any others please do let me know! Just a couple of outfits from the past few days! So, have you also found yourself sticking to a certain colour palette? Or have you found the holy grail of colours that will fit perfectly in to revive what's already in your wardrobe? Would love to hear your thoughts! 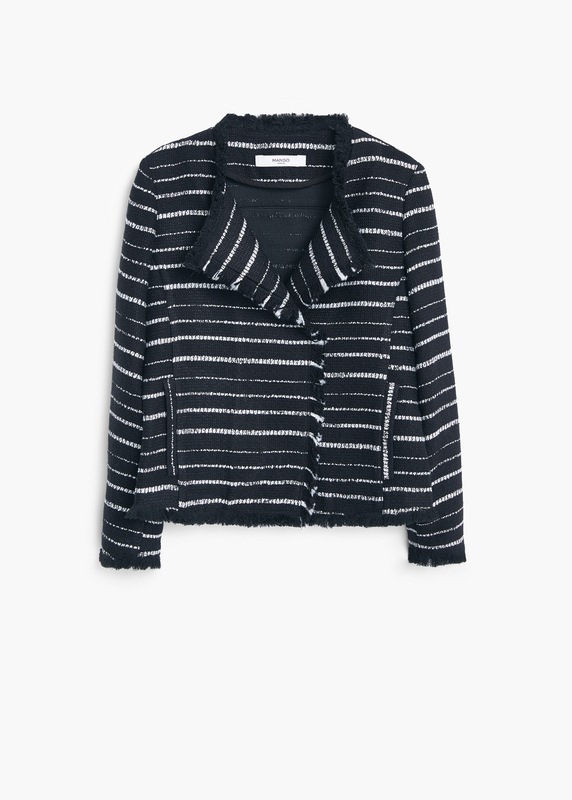 Love the Mango jacket but sadly I can't fit in their standard range, boooo! Not boring at all! I do seem to be going in a monochrome direction too, (I blame The Frugality :-D), but as you say at least you get extra mileage out of your wardrobe that way! The options seem to be endless when you are only dealing with black and white in your wardrobe! I think I may have to add some colour in the way of accessories! Oh the Mango jacket is just perfect for you. I love it. I wish I needed it though - I've got my sensible head on at the moment and it's all warm stuff. Shame about the dress - it does look good in the picture but you know yourself if you're comfortable or not. It's like me with my red dress - looks fab but the waist is a little high on me so doesn't sit where I want it to ... I need to let it go but I love the colour and the print! And the blouses look lovely on you but I would be the same as you on the too much frills bit as I tried on something similar in Primark and I found the flouncy cuffs too much to handle, besides which, I nearly always shrug my sleeves up. I've got loads of black ribbon in the house - time to have a play methinks! Fingers crossed I think I've found an alternative to the Mela maxi dress....but I'm keeping schtum until it arrives and I see if I can make it work! I just can't wear clothes that need to be fiddled and fussed with anymore....faffing drives me nuts! That is such a great jacket Michelle, I can see you will get loads of wear out of it....I never tire of monochrome, it just always looks so chic! Thats a pity about the maxi dress, but I agree if its not perfect, back it goes...That is definitely my mantra now!! Look forward to seeing what your alternative dress looks like?! The Converse are my go-to shoe of the moment....I can't get enough of them! You know I think the M&S blouse is cut small as although I'm wearing a size 12 in the pic it is quite tight across the bust....where I am not so blessed! The even have a button between each button to stop gaping but the buttons were tiny and really fiddly! I like the texture of the black and white jacket. It makes it relaxed, and perfect for anyone with a casual lifestyle.